Pacific Northwest National Laboratory announces the results of two studies demonstrating consumers and information technology can play an active role in managing the grid. New technologies are helping find and correct potential problems on the electrical grid to help prevent blackouts. The Grid Friendly Appliance Controller is a sensor installed in an appliance that can detect when the electricity grid is under stress and then turn the appliance off. RICHLAND, Wash. — The Department of Energy’s Pacific Northwest National Laboratory announced today the results of a year-long effort to put the power grid in the hands of consumers through technology. The Pacific Northwest GridWise™ Demonstration Project found that advanced technologies enable consumers to be active participants in improving power grid efficiency and reliability, while saving money in the process. On average, consumers who participated in the project saved approximately 10 percent on their electricity bills. The project was funded primarily by DOE, with other support provided by utilities and manufacturers. It involved two separate studies to test demand-response concepts and technologies. The Olympic Peninsula Project found homeowners are willing to adjust their individual energy use based on price signals — provided via information technology tools. The Grid Friendly™ Appliance Project demonstrated that everyday household appliances can automatically reduce energy consumption at critical moments when they are fitted with controllers that sense stress on the grid. Both studies helped reduce pressure on the grid during times of peak demand. "As demand for electricity continues to grow, Smart Grid technologies such as those demonstrated in the Olympic Peninsula area will play an important role in ensuring a continued delivery of safe and reliable power to all Americans," said DOE Assistant Secretary for Electricity Delivery and Energy Reliability Kevin Kolevar. "The department remains committed to working with industry to research, develop and deploy cutting-edge technologies to power our electric grid and help maintain robust economic growth." The 112 homeowners who participated in the Olympic Peninsula project received new electric meters, as well as thermostats, water heaters and dryers connected via Invensys Controls home gateway devices to IBM software. The software let homeowners customize devices to a desired level of comfort or economy and automatically responded to changing electricity prices in five-minute intervals. To reduce usage in peak periods, when electricity is most expensive, the software automatically lowered thermostats or shut off the heating element of water heaters to the pre-set response limits established by individual homeowners. Participants received constantly updated pricing information via the Internet. The ability to connect the homes with energy providers as well as the grid was made possible through IBM technology known as a service oriented architecture (SOA). A “virtual” bank account was established for each household and money saved by adjusting home energy consumption in collaboration with needs of the grid was converted into real money kept by the homeowners. With the help of these tools, consumers easily and automatically changed how and when they used electricity, for their own financial benefit and the benefit of the grid. “The tools used in the study gave consumers the chance to be active participants in managing the electric grid. When you give people the right tools, most of the time they will put them to good use,” said Rep. Norm Dicks, D-Bremerton. The information, communications and control technologies and algorithms provided by Pacific Northwest National Laboratory, IBM and Invensys Controls helped consumers in the study become an integral part of power grid operations on a daily basis – and especially in times of extreme stress on the electrical distribution system. A combination of demand response and distributed generation reduced peak distribution loads by 50 percent for days on end. Over the duration of the study, participants who responded to real-time prices reduced peak power use by 15 percent. “This research is vital because decreasing power consumption during the busiest times on the power grid improves efficiency and reliability and reduces the need to build additional infrastructure,” said Sen. Patty Murray D-Wash. In the Grid Friendly Appliance project, Grid Friendly Appliance (GFA) controllers were embedded in dryers and water heaters in 150 homes in Washington and Oregon. 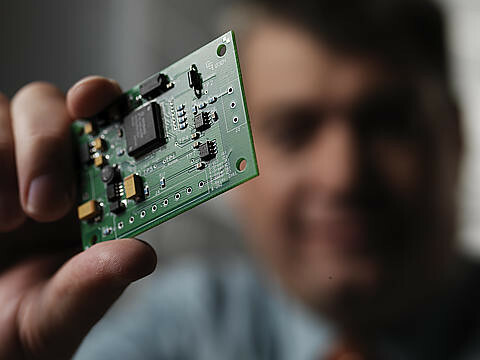 The GFA controller is a small electronic circuit board developed by researchers at PNNL. The GFA controller detects and responds to stress on the electricity grid. When stress is detected, the controller automatically turns off specific functions like the heating element in the dryer. This momentary interruption can reduce electricity consumption enough to stabilize the balance between supply and demand on the grid without the need to turn on inefficient gas-turbine generators. The study found that Grid Friendly Appliance controllers have the technical capacity to act as a shock absorber for the grid and can prevent or reduce the impact of power outages. Such events occurred once a day on average, each lasting for up to a few minutes. The appliances responded reliably and participants reported little to no inconvenience. The vast majority of homeowners in the study stated they would be willing to purchase an appliance configured with such grid-responsive controls. “This ongoing research at Pacific Northwest National Laboratory is a critical part of moving the electric grid into the 21st century and will help ensure the security of the nation’s energy systems while helping consumers save money as energy prices continue to rise,” said Sen. Maria Cantwell D-Wash. The Department of Energy's Bonneville Power Administration, PacifiCorp, Portland General Electric, the City of Port Angeles and Clallam County PUD #1 were partners and financial contributors to the Pacific Northwest GridWise Demonstration Project managed by PNNL. Large in-kind contributions from industrial collaborators include Sears Kenmore dryers produced by Whirlpool Corporation and real-time event software and distributed automation and analytics developed by IBM’s Thomas J. Watson Research Center. For additional study details, including access to the full reports, partner participation overview and fact sheet visit GridWise at PNNL.